Wine intelligence without the bs. A small sample of the November newsletter. This month, members received wines from Hungary, New Zealand, France, South Africa and Spain, as well as a Tawny Port. All that's necessary for the perfect turkey-palooza! If you missed out on this months wines... sign up for Wine Nerd by emailing me now. Take a sip of this Sparkling wine and you won’t believe its price. You could put it in a blind tasting of some highly regarded sparkling wines from around the world, and it would be a serious competitor. It’s bright, lively and delicious, with some taught citrus flavors and a beautifully clean finish that is very refreshing. 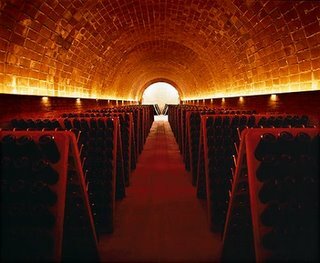 Cava is the Spanish version of Champagne, and is made in the same method: to simplify the process… grapes are pressed and the juice is fermented in stainless tanks. Upon completion, the juice is bottled and sealed along with some added yeasts that cause a secondary fermentation to begin inside each bottle. Carbon dioxide is given off during this fermentation and results in a carbonated wine. The bottles are kept at an angle in racks for up to three months (and turned daily), allowing the yeasts to settle at the neck of the bottle for easy removal before corking. There are less time-consuming ways to make sparkling wine, but this is the traditional method pioneered by a monk named Dom Pérignon in the Champagne region, France. 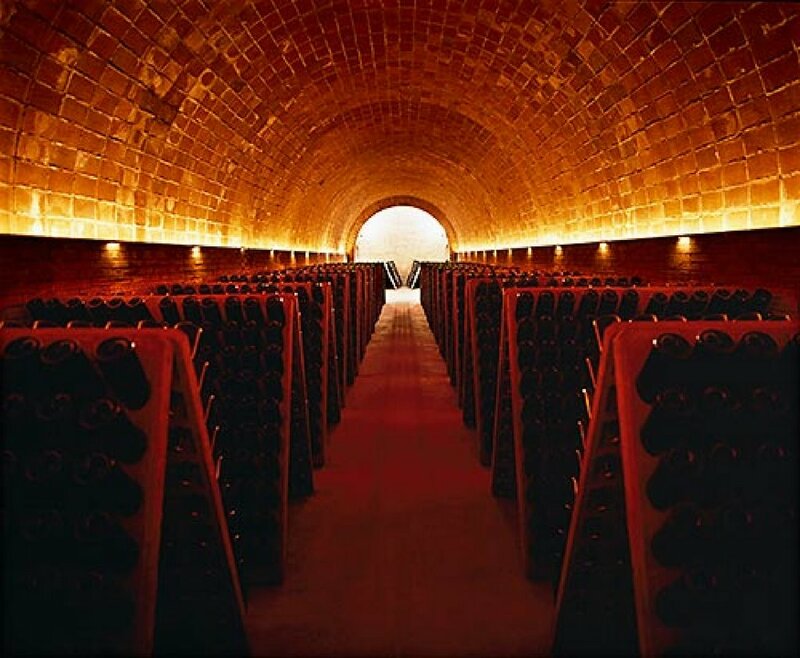 Image: Bottles of Cava sit at an angle in racks for up to three months, causing yeasts to settle before removal. The Penedés region where Cristalino originates is just west of Barcelona, and is known mostly for Cava production but does produce some notable other wines (mostly dark, heavy reds made form Grenache & Monastrell) But since the grapes used in this wine are much lighter-bodied varietals than the Chardonnay and Pinot Noir used in most Champagnes, it’s naturally a lighter and more delicate wine, making it ideal to serve as an aperitif (to get guests mouths watering) before a big meal. It’s also a great ‘bubbly’ for making Bellini’s or Champagne Cocktails. While there are many cocktails using Champagne, there is only one Champagne Cocktail. And while you won’t be using real Champagne with this, I find the drier, crisper style of Cava works better anyway for this classic, elegant drink. Place a small sugar cube/lump in a champagne flute. Add a few drops of Angostura Bitters, and a _ Tablespoon brandy. Peal a Quarter-sized piece of lemon rind, squeeze into glass and rub on the rim, then drop the rind into the glass. Do the exact same with a like-size piece of orange rind. Then fill the glass with some Cava and viola… Champagne Cocktail. Whooaa! A stunner! The zesty, citrus-fresh mouthful and slight steely texture make this a superb wine to enjoy with white meats. The Irsai Olivér grape is similar to Muscat, so the wine has a tinge of riper flavors making it even more delectable. Tasting this was a great surprise, and of the best kind. Wine has a history in Hungary dating back to the 3rd century AD. Attila the Hun apparently granted his favored warriors with land in the Tokay region in the northeast. Vines were planted all over, and included many Italian and French varietals. The country has had its share of problems though, including a 150-year occupation by the Turks who destroyed many vineyards, and the total neglect of wine heritage during the Communist years. Today it’s the Tokay region that is most famous, known for intensely flavorful dessert-style wines made from Aszu grapes (harvested very late when they’re laden with sugar). Nyakas Cellars is found in Etyek-Buda, more central and nearby Budapest. I would highly recommend getting another bottle of this come next spring/summer to enjoy on warm evenings with just about any little appetizer. At this time of year, it makes the perfect wine to start the Thanksgiving dinner with before moving onto the reds. The Southwest of France has become a recent favorite region of mine. France has always championed the major appellations like Bordeaux, Burgundy and Champagne that receive most of the attention. True, the Southwest traditionally produced large quantities of lackluster, uninspiring wines, but anyone that believes that’s the case today should get their taste buds checked. There are numerous world-class producers in this region, many within the Languedoc-Roussillon appellation that stretches from Montpellier in the east to Perpignan on the border with Spain. Most of the wines are classified as Vins de Pays, the government approved classification, though there are many winemakers that forfeit this to experiment with newer varietals and make what they feel is better suited to their estate. As a result, there are many small wineries making superb wines of distinct character. The French love the notion of terroir – that a wine truly expresses its origin – and I think it is more evident here than anywhere else. Mas de Daumas Gassac is probably the most revered producer in the appellation, though there are many more. Domaine de la Casa Blanca makes two wines, the Collioure and the Banyuls (similar to port). The estate is small, consisting of approximately 12 hectares (24 acres). The vines are between 70 and 100 years old, resulting in extremely low-yields of more intensely flavored grapes. This Collioure is aged in small oak barrels that rounds out the rich, berry flavors and touch of anise on the palate to create a lovely, complex wine. The wine is a superb addition to any table serving well herbed roasts with a rustic feel. For Thanksgiving, you’ll probably want to crack this bottle open for all the dark meat fans at the table. Wine Nerd is based around one simple truth: there are just too many wines on the market, and thus it is now harder than ever to source wines of true interest and excitement. Finding a killer bottle that really stands out is a challenge. Working for a wine import company in Manhattan, I am lucky enough to get to know and taste some of these truly amazing wines. These extraordinary selections are what keep me passionate about wine. This blog focuses on small production, artisan-style wines from all over the world that stand out from the ordinary. It might be the easiest way to learn about and discover amazing wines. My previous selections speak for themselves. And of course, with good wine goes good food, hence the restaurant and other titbits... Enjoy. David Cope, aka Wine Nerd.